But while this fine little tracker served me well and provided me with some really great shots of the sky, it left me disappointed about a month back when without warning, it decided to give up the ghost on me as chronicled in this blog post. Winter is rapidly approaching and I needed to get a replacement stat! Enter the Sky-Watcher Star Adventurer! - It’s a true German equatorial mount vs a tracking platform whereas the SkyTracker series and Vixen Polarie. While both provide the same function, the ability to have a counterweight to help keep tracking accurate under heavier loads was a big factor. The counterweight option is available on the SkyTracker Pro, but the Star Adventurer has a maximum payload of a full 2kg more. It seemed a better option, as I do have a couple of rather heavy lenses. - It’s a multipurpose mount with pan effects for any type of time lapse photography. I’ve been getting more into time lapse photography since last summer so I figured this could be a useful tool for this purpose. I particularly look forward to using in this manner the next time I’m out shooting the Aurora Borealis. you need for exceptional sky photography. The equatorial wedge attaches to the bottom of the mount with a standard 3/8 connector like most camera equipment. It also has a good weight and is built of solid materials to ensure there is no flex. It has standard locking altitude and azimuth controls with fine-tuning screws that make polar alignment very easy. Anyone who’s used an equatorial mount with a telescope will be immediately familiar with this setup. The next 2 items are the mounting options. The first is a small ball head adapter used for tracking with just a camera. It attaches to any standard ball head with a standard 3/8 connector. On this underside of this adapter are Vixen dovetail plate rails that allow it to be locked securely into the Star Adventurer. This option is used when you’re just tracking with a lighter-weight camera and lens combo. The second is a Vixen dovetail plate with a “Fine Tuning Mounting Assembly” on one end. This is used for mounting heavier loads like cameras with heavy lenses or small telescopes. On one end of the plate is the fine tuning mount. It has a 1/4 screw to attach it to a camera or small telescope. A 3/8 adapter is also included for attaching to other equipment. This acts as the declination axis of the equatorial mount. Its clutch system is similar to the main RA clutch on the Star Adventurer and very solid. It also includes a knob that acts as a slow motion control on the dec axis to make framing your target even more convenient. At the other end of the dovetail is a threaded hole into which the counterweight bar is screwed to balance out the load. 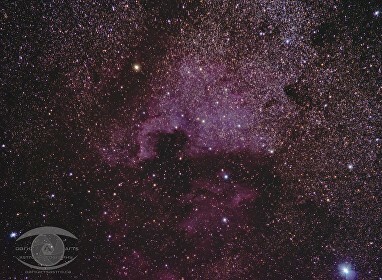 Cygnus / Deneb Region of the Milky Way. North American and Pelican Nebula and Deneb. My scope attached easily. However, right away I could see problems. The counterweight isn’t nearly heavy enough to balance the scope. Not even close. It would take a much heavier counterweight to balance out my ED80 and a camera. Also, since the scope is attached using the 1/4 bolt form the fine-tuning head, there’s no way to balance the scope on the declination axis.